DC Comics Editor-in-Chief Bob Harras isn't interested in stable relationships for The New 52. 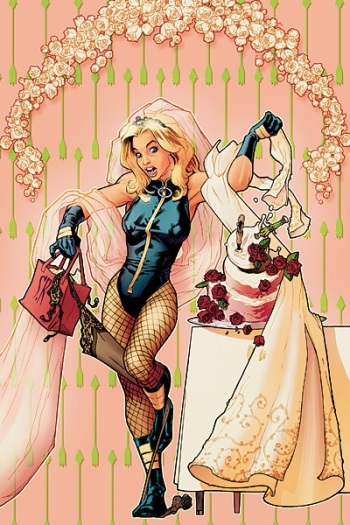 Q: Is it true that no characters in the new 52 can get married now? Bob Harras: The new 52, we want surprises. We want things to happen that may be unexpected with romances, relationships. What we ask in general is that we don't want any of our characters rushing into stable relationships. The only character we have married is Buddy Baker, Animal Man, and that was part and parcel of the character. DC Comics has received a lot of backlash lately over editorial choices. Editorial decisions prohibited showing the wedding of Batwoman, Kate Kane, to her girlfriend Maggie Sawyer at the last minute. Those changes led to the decision by co-authors J.H. Williams and W. Haden Blackman to leave the series this coming December. Outrage over a contest calling for art submissions of Harley Quinn naked and suicidal has also been widespread. The New 52 is the 2011 relaunch of the entire line of DC Comics monthly superhero titles. All existing titles were cancelled, and 52 new series were launched.